Select coverage of research insights, comments, and views about the K-12 Cyber Incident Map, school cybersecurity and education privacy issues. Media contact information is available here. Foresman, Betsy. “On cybersecurity, educational institutions have a people problem.” EdScoop. 1 April 2019. De La Rosa, Shawna. “Untrained staff, students remains K-12’s biggest cybersecurity threat.” Education Dive. 1 April 2019. Cavanagh, Sean. “6 Steps for Preventing and Cleaning Up Cyberattacks.” Education Week. 19 March 2019. Wan, Tony. “Edtech’s Blurred Lines Between Security, Surveillance and Privacy.” EdSurge. 5 March 2019. Harper, Amelia. “Report: Few districts have full-time role focused on student privacy.” Education Dive. 1 March 2019. Robinson, Helen. “K-12 cyber report leaves little room for confidence.” The Colorado Springs Business Journal. 22 February 2019. Schaffhauser, Dian. “K-12 Cyber Strikes Cost Millions Last Year.” T.H.E. Journal. 19 February 2019. Harper, Amelia. “122 K-12 cybersecurity threats reported last year.” Education Dive. 11 February 2019. Rock, Amy. 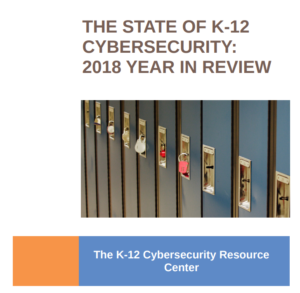 “Report: K-12 Schools Experienced 122 Cyber Attacks in 2018.” Campus Safety. 10 February 2019. Herold, Benjamin. “Schools Suffered at Least 122 Cybersecurity Incidents Last Year.” Education Week. 7 February 2019. Tate, Emily. “Report: A New Cybersecurity Incident Strikes K-12 Schools Nearly Every Three Days.” Edsurge. 7 February 2019. McKenzie, Lindsay. “A Class Registration Bot Backfires.” Inside Higher Education. 15 January 2019. Goldchain, Michelle. “U.S. Education Industry’s Cybersecurity Lags Behind 16 Other Sectors.” Ed Week Market Brief. 8 January 2019. Herold, Benjamin. “Education Week’s Biggest K-12 Technology Stories of 2018.” Education Week. 20 December 2018. Brown, Emily Ann. “K12 schools get ready for action with edtech.” District Administration. 19 December 2018. Genota, Lauraine. “Staff Email Addresses Removed From District Websites to Improve Cybersecurity.” Education Week. 5 December 2018. Herold, Benjamin. “They Hacked Their School District When They Were 12. The Adults Are Still Trying to Catch Up.” Education Week. 7 November 2018. Dobo, Nichole. “Worry less, learn more about your child’s laptop or tablet.” 30 October 2018. The Hechinger Report/New York Times. Mary Beth Almond. “RCS officials push password changes following data breach.” 16 October 2018. Rochester Post. Associated Press. “Michigan Student Hacker Shows Holes in District’s System.” 13 October 2018. Campisi, Jessica. “How much responsibility should administrators shoulder for data breaches?” 19 September 2018. Education Dive. Ms. Smith. “New GandCrab ransomware variant hammers Florida school district.” 16 September 2018. CSO. Zimmerman, Eli. “Mindful Tracking Cookie Policies Improve K—12 Data Security.” September 2018. EdTech: Focus on K-12. Warner, John. “The Watchers And The Watched.” Inside Higher Education. 5 August 2018. Majumdar, Bambi. “New tactics boost cybersecurity in schools.” Multibriefs. 1 August 2018. Hand, Bob. “Four approaches K-12 IT directors can take to address security threats.” EdScoop. 23 July 2018. Healy, Michelle. “Protecting Student And Employee Data In The Cyber Age.” American School Board Journal. June 2018. Olenick, Doug. “Cyberattack map shows impacted U.S. school districts.” SC Media. 2 May 2018. Schaffhauser, Dian. “9 Major Trends That Will Dominate Ed Tech” T.H.E. Journal. 25 April 2018. Jones, Jacinthia. “Tennessee says its online testing was hacked. And it has happened in other states, too.” Chalkbeat. 23 April 2018. Herold, Benjamin. “Thousands of Android Mobile Apps Improperly Track Children, Study Says.” Education Week. 13 April 2018. Schaffhauser, Dian. “A Warning Call to K–12: NEPC Turns Off Facebook Account.” T.H.E. Journal. 11 April 2018. Riddell, Roger. “Districts struggle with status as popular hacker targets.” Education Dive. 10 April 2018. Baumhardt, Alex and Julin, Chris. “Schools prove soft targets for hackers.” APM Reports. 9 April 2018. Molnar, Michele. “Privacy Experts Assess Potential K-12 Fallout From Facebook’s Crisis of Trust.” Education Week. 21 March 2018. Kontzer, Tony. “How Educational Institutions Are Failing to Adequately Protect Student Data.” RSA Conference. 28 February 2018. Fine, Ariana. “Securing sites.” District Administration. 19 February 2018. Wait, Patience. “Security, privacy weaknesses pervade state and local education websites.” EdScoop. 5 February 2018. Schaffhauser, Dian. “School Agencies and Districts Do Crummy Job of Protecting Website Visitor Security and Privacy.” T.H.E. Journal. 1 February 2018. Doctorow, Cory. “America’s school systems serve unencrypted web resources that are riddled with ad-tech trackers.” Boing Boing. 1 February 2018. Zurier, Steve. “K-12 Study Gives Schools Low Marks for Protecting Student Privacy Online.” Dark Reading. 31 January 2018. Schwartz, Sarah. “State and District Education Websites Fail to Disclose Ad Trackers, Study Finds.” Education Week. 31 January 2018. Johnson, Sydney. “Cybersecurity Report Spotlights Privacy Concerns on State Education and District Websites.” EdSurge. 30 January 2018. Brown, Emily Ann. “Most devices subject to recent Intel chip vulnerabilities, experts say.” Education Daily. 18 January 2018. Schaffhauser, Dian. “Ransomware Breach Strikes 700 Texas Students.” T.H.E. Journal. 10 January 2018. McCray, Vanessa. “Criminals in cyberspace make schools’ data a target.” Atlanta Journal Constitution. 24 December 2017. Bogardus Cortez, Meghan. “3 Cybersecurity Resolutions for K–12 School Districts.” EdTech: Focus on K-12. 21 December 2017. Hart, Alexandra. “Ransomware Attack Leads to Breach Affecting 700 Students in 39 Texas School Districts.” Texas Standard. 20 December 2017. Catalano, Frank. “Apparent Google update glitch disconnects student Chromebooks in schools across the U.S.” GeekWire. 5 December 2017. Schaffhauser, Dian. “The Problems with FERPA and COPPA in 21st Century Learning.” T.H.E. Journal. 5 December 2017. Herold, Benjamin. “Schools Struggle to Keep Pace With Hackings, Other Cyber Threats.” Education Week. 29 November 2017. WNYC. “Hackers Target Student Data as Schools Report Increasing Cyberattacks.” The Takeaway. 24 October 2017. Hobbs, Tawnell D. “Hackers Target Nation’s Schools.” Wall Street Journal. 23 October 2017. Cox, Joseph. “‘Dark Overlord’ Hackers Text Death Threats to Students, Then Dump Voicemails From Victims.” Daily Beast. 5 October 2017. Bogardus Cortez, Meghan. “3 Cyberhygiene Tips for K–12 End Users.” EdTech: Focus on K-12. 3 October 2017. Herold, Benjamin. “Hacked Twitter Accounts a New Headache for Schools.” Education Week. 28 September 2017. Wan, Tony. “How to Protect Education Data When No Systems Are Secure.” EdSurge. 25 September 2017. Abamu, Jenny. “Why the State of Surveillance in Schools Might Lead to the Next Equifax Disaster.” EdSurge. 19 September 2017. Wan, Tony. “Tales From 3 Surveys: Hope, Buzz and Fears to Expect in the 2017-18 School Year.” EdSurge. 5 September 2017. Brown, Emily Ann. “ED warns schools of another widespread ransomware attack.” Education Daily. 20 July 2017. Chang, Richard. “K–12 Cyber Incidents Have Been Increasing in 2017.” THE Journal. 8 June 2017. Brown, Emily Ann. “Experts: Google phishing attack underscores data protection issues.” Education Daily. 25 May 2017. Majumdar, Bambi. “Why schools need to increase cybersecurity education.” MultiBriefs. 28 April 2017. Petersen, Ryan. “Crafting a Solid Cybersecurity Defense.” EdTech Magazine. 4 April 2017. Chang, Richard. “EdTech Strategies Publishes K–12 Cyber Incident Map.” THE Journal. 31 March, 2017. Hudgins, Julia. “Scam hits school districts nationwide, has links to Russia.” The Dispatch. 23 February 2017. Dupuy, Beatrice. “Cyberscam that hit Bloomington school workers puts Minn. districts on defensive.” Star Tribune. 17 February 2017. Brown, Emily Ann. “IRS issues guidance to schools, among others, on W-2 phishing scam.” Education Daily. 15 February 2017. Ravipati, Sri. “W-2 Phishing, Wire Transfer Scam Targets School Districts.” THE Journal. 13 February 2017. Molnar, Michele. “Phishing Scam Targets School Employees’ Information.” Education Week. 13 February 2017. Cox, Joseph. “Hackers Are Targeting Schools in a Wave of Tax Info Phishing Attacks.” Motherboard. 13 February 2017. Doran, Leo. “State K-12 Cybersecurity Audit Finds Missouri District Unprepared.” Education Week. 27 April 2016. Cavanagh, Sean. “End of Support for Microsoft Server 2003 Puts Heat on K-12 Districts.” Education Week. 17 July 2015. Kamisar, Ben. “Group Calls on Companies to Safeguard Student Data.” Education Week. 23 Oct. 2013. Cavanagh, Sean. “Windows XP Deadline Puts Pressure on Schools.” Education Week. 22 May 2013.